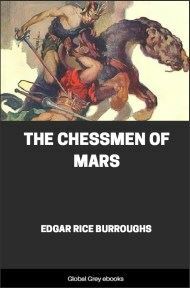 The Chessmen of Mars is the fifth book of the Barsoom series. 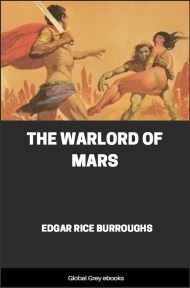 In this novel Burroughs focuses on a younger member of the family established by John Carter and Dejah Thoris, protagonists of the first three books in the series. The heroine this time is their daughter Tara, princess of Helium, whose hand is sought by the gallant Gahan, Jed (prince) of Gathol. Both Helium and Gathol are prominent Barsoomian city states. Tara of Helium rose from the pile of silks and soft furs upon which she had been reclining, stretched her lithe body languidly, and crossed toward the center of the room, where, above a large table, a bronze disc depended from the low ceiling. Her carriage was that of health and physical perfection—the effortless harmony of faultless coordination. A scarf of silken gossamer crossing over one shoulder was wrapped about her body; her black hair was piled high upon her head. With a wooden stick she tapped upon the bronze disc, lightly, and presently the summons was answered by a slave girl, who entered, smiling, to be greeted similarly by her mistress. 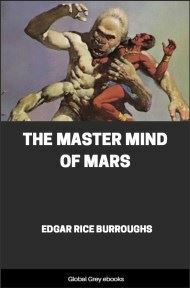 "Yes, Tara of Helium, they come," replied the slave. "I have seen Kantos Kan, Overlord of the Navy, and Prince Soran of Ptarth, and Djor Kantos, son of Kantos Kan," she shot a roguish glance at her mistress as she mentioned Djor Kantos' name, "and—oh, there were others, many have come." 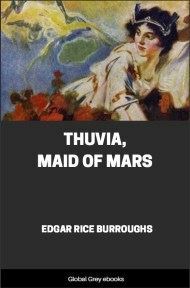 "The bath is ready, Tara of Helium," the girl responded, her eyes still twinkling with merriment, for she well knew that in the heart of her mistress was no anger that could displace the love of the princess for her slave. Preceding the daughter of The Warlord she opened the door of an adjoining room where lay the bath—a gleaming pool of scented water in a marble basin. Golden stanchions supported a chain of gold encircling it and leading down into the water on either side of marble steps. A glass dome let in the sun-light, which flooded the interior, glancing from the polished white of the marble walls and the procession of bathers and fishes, which, in conventional design, were inlaid with gold in a broad band that circled the room. Tara of Helium removed the scarf from about her and handed it to the slave. Slowly she descended the steps to the water, the temperature of which she tested with a symmetrical foot, undeformed by tight shoes and high heels—a lovely foot, as God intended that feet should be and seldom are. Finding the water to her liking, the girl swam leisurely to and fro about the pool. With the silken ease of the seal she swam, now at the surface, now below, her smooth muscles rolling softly beneath her clear skin—a wordless song of health and happiness and grace. 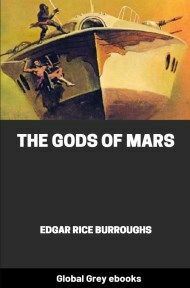 Presently she emerged and gave herself into the hands of the slave girl, who rubbed the body of her mistress with a sweet smelling semi-liquid substance contained in a golden urn, until the glowing skin was covered with a foamy lather, then a quick plunge into the pool, a drying with soft towels, and the bath was over. Typical of the life of the princess was the simple elegance of her bath—no retinue of useless slaves, no pomp, no idle waste of precious moments. 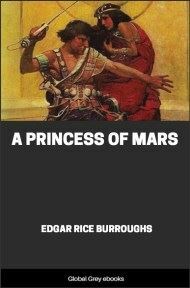 In another half hour her hair was dried and built into the strange, but becoming, coiffure of her station; her leathern trappings, encrusted with gold and jewels, had been adjusted to her figure and she was ready to mingle with the guests that had been bidden to the midday function at the palace of The Warlord. The mother and daughter exchanged the gentle, Barsoomian, "kaor" of greeting and kissed. Then together they entered the gardens where the guests were. 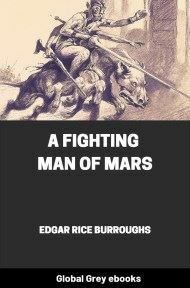 A huge warrior drew his short-sword and struck his metal shield with the flat of it, the brazen sound ringing out above the laughter and the speech.